Abhishek Bachchan poured out his praises of Guzaarish, releasing this Friday, and starring his wife. 'GUZAARISH is truly magical! Sanjay is pure genius. Everything about the film, according to me, was pitch perfect. It's spellbinding. Every actor in the film has reason to be truly proud of their work,' he tweeted. But he's not the only playing happy family. 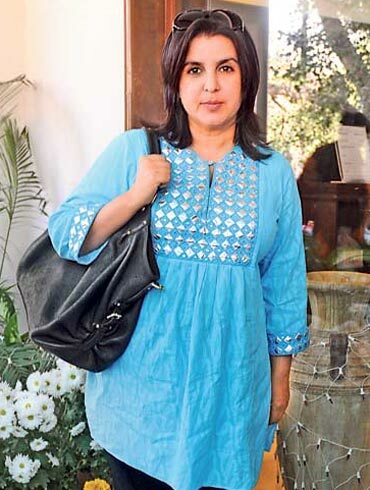 Director Farah Khan is pushing her muscle power, and trying to get evicted contestant Samir Soni back on Bigg Boss. 'Hav already spoken 2 COLORS, n in all probability Samir should b bk in the house,' she tweets. But not all B-Town's girls are partying. Some like these are working very hard! Lara Dutta was all excited despite being very busy. She says, 'Last 2 shots 2 go & then a quick photoshoot left! Hanging in thr at a long day at work! Leaving 2morrow 2 get on location 4 "Chalo Dilli"!